ST. PETERSBURG, Florida- Bison Financial Group, a real estate advisory firm based here, announces the closing of a one-acre Downtown St. Petersburg redevelopment site in the rapidly gentrifying Mirror Lake District. The property is currently being utilized as 102 multifamily units in 5 frame buildings built in the 1920s. Bison acted as a development advisor to the seller and also arranged the acquisition financing for the buyer. 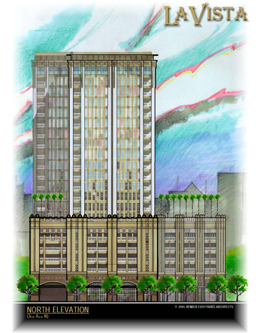 The project was recently approved by the City of St. Petersburg for the construction of 196 condominium units above ground floor office/retail and parking garage. According to David Repka, co-founder of Bison, “This project is the case study for how Bison can add value to the development process. We initially met with the property owner to discuss financing a hi-rise condo tower with potential sales north of $92 million. As we pointed out the complexities and risks of a development project the seller changed directions and sought a more conservative joint venture with an experienced developer. When JV talks stalled, the property owner proposed a buyout which was acceptable to our investor.” “The investor we brought to the table immediately recognized the dynamics of the site and how it can be positioned to compete with the other development projects in the pipeline and compliment the beautiful location”, said Jared Repka of Bison. In addition to arranging the sale, the principals of Bison arranged a bridge loan to acquire the property. The bridge loan has a starting rate based on Prime and gives the borrower enough time to get their development plan in place. The anticipated sellout is over $92 million. Bison advises a network of local, regional & nationwide developers that build projects in Florida and select markets nationwide. Bison arranges transactions for development/value-added properties and stabilized income producing properties. The principals of Bison are the Florida Partners for Regional Capital Group, one of the nations leading private, commercial real estate lenders.